Mostly sunny, mostly flat and mostly downwind. What more could a cyclist want? Today a nice ride along the coastal plain in South Gippsland. After Yarram more rural terrain with fields and forests. I saw a kangaroo and many rabbits munching on tender grass next to the road. I also passed quite a few protest signs for Basslink and a local explained the controversy to me at Woodside. North of here is the Latrobe Valley with rich coal deposits and many power plants. A British firm has proposed Basslink power lines between this region and Tasmania, passing through the forests and then under the Bass Strait. Most of the protest here in Gippsland is because high pylons are proposed through the forest, instead of going underground (I passed signs for underground gas lines). Also some concern about the "exclusion zone" near the cable being off limits to fishing. In Tasmania the concern was fields generated by the monopole cable might corrode other undersea cables. I stopped at Woodside General Store at 20 km. The proprietor laughed when I asked if there was a place to get brekky. No worries, I decided to pedal on to Sale. This route continued mostly flat along the forest. It was a quiet road with good shoulders. Close to Sale, one section of roadworks and crossing over a one lane bridge. Signs indicated this area had large wetlands. At 72 km, Sale was a small town (population 13,000) that was bustling on a Saturday morning. I walked past high clock tower and through a pedestrian mall. The local Lions Club was selling sausages. The Lions told me about local motorcycle club having a rally bringing toys for children and also horse jumping competition at the showgrounds. It was a beautiful sunny day with light tailwinds. I continued from Sale along the busier Princes Highway and to Stratford on the Avon River, another small town with half a dozen stores on the main street. Got a few lunch items at the grocery store. From Stratford mostly rural areas with a few slight hills and trees. 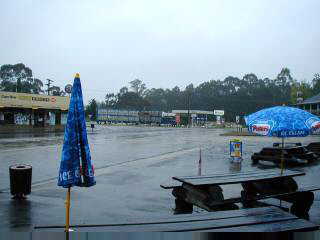 One of the only businesses was Billabong Roadhouse at 113 km. Here I met Martin who was cycling from Melbourne. His plan was to ride past Mount Kosciusko, the tallest mountain in Australia (2228m). He had just finished a year at Uni and figured just like aborigines go on a walkabout, he would do a rideabout. Winds were a bit mixed the last 28 km to Bairnsdale. As I got closer, several motels, stores and signs of this being a larger city. Bairnsdale is also start of the Lakes and Wilderness tourist area. I walked downtown and past tourist info center. Found a place at Kansas City motel. I wasn't the only person with an American accent who asks about the name (former owner was Greek with name something like Kantjas but people called him Kansas). 141 km today, 23757 km cumulative. A nice Sunday ride with increasing hills and increasing clouds. According to the locals, hills don't start until Orbost, so today was just for practice. The first half of the ride was through a vacation area with many accommodations. Looks like the type of place people from Melbourne would go for week of fishing, walking through forests and relaxation. Second half of the ride were small places listed as "timber towns", though I didn't see signs of recent logging. Had a slow start with brekky in Bairnsdale before I left and another stop in Nicholson at 10 km. Two more small settlements of Johnsonville and Swan Reach before I descended into Lakes Entrance at 36 km. As the name suggests, this area has several large freshwater lakes that drain through a narrow opening at Lakes Entrance. A small fishing fleet here and several kms of motels and beach businesses. Had another brekky here. The sizes of hills increased after Lakes Entrance. Locals still think this is "flat" with real hills coming after Orbost. Clouds slowly increased with light rain as a store front was passing through. At 58 km Nowa Nowa had a General Store and a motel. One more motel at Newmerella before I reached Orbost at 96 km. The rain picked up not long after I checked in. Just prior to Orbost the road crossed a wide Snowy River (I'll have to look up the ballad, Man from Snowy River). Orbost had nice visitor center and short main street. Town was mostly quiet on a Sunday afternoon. Looking at the map, it looks like I'm running out of Australia! I've been making good progress towards Sydney, though will take some breaks along the way so as to arrive not too long before the 21st. 96 km today, 23853 km cumulative. Today a shorter ride through a more hilly region. Unsettled weather last night, but dry this morning as I set off. Signs are now indicating distances to Sydney. Some gentle hills in the first 10 km and then past a sawmill at Brodribb. I saw a few log trucks today, difficult to see a good pattern of where they were harvesting wood and where the mills were, since full trucks passed in both directions. Some more climbing after 10 km and through rest of the day. Also State Forests with occasional trails. At 26 km was Cabbage Tree Creek. The store had shut, so only a B&Band an aboriginal gallery in town. After this point, more clouds and also some thunder. For a brief moment at 35 km it rained in big drops and just as quickly cleared up and became warm and sunny again. A longer hill to 56 km where elevation sign indicated 260m before bit more climbing. A nice descent here and after 70 km it became flat. Cann River is a small town established around a road junction. One road continues around the coast to Sydney (599 km) the other goes via Canberra to Sydney (584 km). One corner has Mobil petrol station bustling with trucks. The next corner has an old Cann River Hotel. The third corner has a cafe with painted landscapes on the building. The last corner has IGA grocery. Beyond these businesses, a few more motels, a post office and another gas station; mostly clustered close to the corner. It was just noon, but decided Cann River would be a nice place to stay. Read, relaxed and looked around town. Also mailed away a few photos to Australian Cyclist Magazine for their photo competition. A nice relaxing afternoon and the first one in a while where cooling was desired rather than heating. 75 km today, 23928 km cumulative. Rain day today. Steady rain when I awoke, so decided to wait until 10 am, checkout time, to see if it cleared. While it lessened to a drizzle, today still seemed like a good rest day. Cann River is both a timber town and a beef and dairy town. First settlers came south from New South Wales. There is a small woodcraft gallery with a large carved wooden motorcycle (no photos, postcards are $3 each). I stopped at laundry and otherwise looked around town. Drizzle and rain continued off and on through the day, making it a good time for a rest day. 0 km today, 23928 km cumulative. Squish, squish. My wet sneakers and flaky Pocketmail device are signs that the weather wasn't quite like forecast. The forecast had called for early drizzle and a clearing afternoon. It rained at 5am, but then mostly dried up as I left. The first of several hills was waiting for me outside town. Also here was a sawmill. Throughout the day, trucks passed full of wood chips...surprisingly close and surprisingly fast. Mostly forests along the way, with different official signs. Close to the Albert State Forest, I passed a sign indicating Mount Drummer and road elevation of 361m. In this area I also got drizzle for the first of two times until Genoa. Genoa was at 47 km. There was a cafe/store and a hotel/motel. Also a general store closed down. It started to rain more heavily, so I used it as an excuse to fix a slow flat back tire caused by a wire. Also here was an old historic bridge that I walked over to the caravan park. The woman at cafe/store wasn't particularly cheerful so decided to continue and hope it didn't rain too much. At 57 km it started raining harder. Not much longer I crossed the border to New South Wales. Hooray!, back to the state I started. After this point some more rain and more hills. I stopped in at Kiah at 94 km and saw the goats above left. Woman at the store indicated three more hills left. A slow climb over the first and then the storm broke. Wow! It was pouring rain as I came down the second hill. I was riding my brakes with water running down the road. At 109 km I dripped into Eden and down the last hill. Found a motel close to center of town. I discovered my Pocketmail was flaky, so difficult to type in messages. The motel heater was nice to dry things out. Eden had small main street, though the Killer Whale Museum was closed. 109 km today, 24037 km cumulative. Yesterday my report was truncated as my Pocketmail was flaky after getting wet, e.g. I'd type "a" and out would come "f". Also the screen was hard to read. Fortunately it dried out and works better. There had been three big hills coming into Eden. Coming down the second of these hills, the rain was coming down in sheets. I was riding my brakes, rain on my glasses and water running over the road. It was fun! Today a shorter distance day with two steep hills and some other hilly areas. The first big hill was climbing out of Eden on Princes Highway. It was followed by a nice descent and rolling terrain. Some roadwork along the way as well. At 20 km was Pambula, described as "historic village", though the main street looking similar to other small towns. From here I took the back road to Merimbula. This was flatter with bike path alongside. I passed an oyster farm and factory but it was too early for their 11 am tour. At 27 km Merimbula was a vacation town where someone might spend a week along the beach. According to local paper, bookings have been up since September 11th as Australians take a drive vacation rather than flying further. From Merimbula I continued along back roads heading towards Tathra. Here was a second large hill (Monk's Hill) leaving town. More quiet forest riding with climbs and descents. At 44 km I stopped briefly at place making garden gnomes. At 47 km I turned west on road to Bega. A few more hills but mostly flatter and more open with pastures and cows. At 60 km came into town of Bega and found a place to stay. Still early, but I've got some time. Bega is known for cheese. I walked out to the Bega Cheese Factory and historic center. Several old displays of milking machinery, butter churns and cheese presses. I was surprised to see how many cheese factories were in the area in 1920. By now they've been consolidated into one or two large plants. On the way back, I crossed the bridge (6th longest in NSW...though I doubt many people come here to see it...mostly something to put in tourist literature). Back and through Bega for the day. 60 km today, 24097 km cumulative. Many short hills today, so lots of climbs and descents. The first hill was at 5 km outside Bega with a lookout. Nice scenery with fields, cows and little bits of mist in the low areas. Other than low fog, it was mostly clear skies. Over this first hill and along a stream at 10 km. However, just as quickly climbing more hills out of the drainage and across McLoed Hill and then to Quaama at 30 km. My next stop was Cobargo at 42 km. Cobargo had a main street with row of shops. By now it was overcast with storm clouds overhead. I waited under an awning as the hardest rain fell. Gave me a chance to read the paper and eat a snack. Another hill coming out of Cobargo and more small hills after that. Light showers as well. Overall made for slower travel to Narooma. Close to town some young male drivers thought it would be fun to sneak up and screetch their brakes, sigh. Narooma was larger town, population 8000, with winding road through town. About 15 km offshore is Montague Island. The tourist info center had interesting displays about the former lighthouse offshore. 79 km today, 24176 km cumulative. If South Australia was the windy state, then New South Wales is finishing as the wet state. The morning started with drizzle. I dawdled a bit to start, but it didn't clear so I set off in the rain. More rolling hills today, though the hills were easier than yesterday. A few days ago, the Eden tourist info center told me they've had southbound cyclists arrive and decide to give up on hills and take the bus. A shame, since it seems the most challenging hills are between Narooma and Eden. Traffic has been increasing today. Many overtaking lanes, but unfortunately these become speedways as cars hurry to pass each other. At 17 km was Bodalla with small general store and stop for brekky. Also a large cheese plant out of town. Noticed here that my rear brakes are mostly worn down and the wheel would thump as I braked. Some rolling hills from here until Moruya at 32 km. Moruya claims "birthplace of the Sydney Harbour Bridge" with a granite quarry north of town. Moruya has population 6,000 and was busy on a Saturday morning. At 58 km was Mogo. This small historic town seemed to have a little of everything for tourists: a gold panning theme park, a sheep shearing shed and a zoo outside town. I walked through town and rode the last distance to Batemans Bay. The last 10 km had more hills as I rode in a rain shower. Batemans Bay has population 13,000 and is big enough for a McDonalds. It was early, but stopped here for the day. Rain and drizzle made that an easy choice. Tomorrow the plan is to tackle hills between here and Canberra. 68 km today, 24244 km cumulative. I crossed an interesting bridge over the Clyde River and then turned inland and up a hill. At 2 km a sign said "Canberra 148", so decided I'd make it in two easy days. The first of several overtaking lanes was here as I slowly climbed. At 10 km a descent back to a bridge over the Clyde River. After this, flat for a while and then some bouncing hills. After 27 km more consistent hills with a long 7 km climb starting at 31 km. The road slowly wound itself up the mountain. Portions were steep enough that I got off and walked for a bit. I like doing this both since it seems to exercise different muscles and makes certain not to overstrain the knees. I passed three safety ramps (runaway truck ramps). Partway up the third was a car towing a trailer. We chuckled at our respective situations... me walking a bike uphill and they caught going too fast downhill. They were pleased to hear there would be two more ramps ahead. I was pleased to be within 2 km of the top. It was a slow climb, but eventually I was at the summit with an elevation of 774 meters. There was a slight downhill, but not as much as I'd expected. 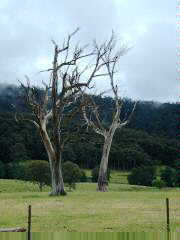 Forests gave way to fields with cattle and sheep. The land was more open and wind also picked up. Over a few more hills was Braidwood. Elevation was 662m, so barely 100 meters below the summit. At Braidwood I met four cyclists from Canberra out for a two week tour along the coast. They had just finished Uni and were now cycling. I was warned of more hills ahead. Braidwood also had half a dozen motorcyclists stopped. At least twenty motorcycles had passed during the morning. Braidwood was settled in the late 1820s with landowners employing convicts. There was a brief gold rush in 1851. The town has many historic buildings along a nice main street. Surprisingly many were open for a Sunday. It was still early, but this looked like a nice place to visit. 61 km today, 24305 km cumulative. Made it to the last state/territory today, hooray! I've now been to all eight capitals with Canberra being the last (NSW: Sydney; Queensland: Brisbane; NT: Darwin; WA: Perth; SA: Adelaide; Victoria: Melbourne; Tasmania: Hobart; Australian Capital Territory: Canberra). Clear skies but strong headwinds today. Mostly calm when I left Braidwood. A few gentle hills as I headed north. Cows were susceptible to herding again. At 26 km the road turned west after road to Goulburn split off. Several larger hills here, fortunately also sheltered the wind somewhat. As I was slowly climbing against a headwind at 37 km, I came to a motorist fixing a flat and struggling a bit with the jack. I stopped and helped her. It seemed like the wind had subsided when I started again. Not much later, I came to Bungendore at 47 km. After that it was flat but into the wind for 6 km and then over more rolling hills. Noticed my rear tire is getting worn. It is about time to find a bike shop again for worn tires, brakes and gears. In this area were several places advertising land...presumably for country subdivisions for those working in Canberra. I came over the last hills and down to Queanbeyan, population 29,000. Traffic was heavier as the road became two lanes. Stopped for lunch before setting off the last few hills to Canberra. Hooray, happy to reach the city limits. I rode through the south of the city with a brief tour for the new and old parliament houses. I next crossed over Lake Burley Griffen and to signs indicating "city centre". It doesn't seem like much of a center, but found a motel close downtown. Central Canberra Apartments has nice rooms with kitchenettes for not too much. I'll be here three or four nights to look around town. 82 km today, 24387 km cumulative.